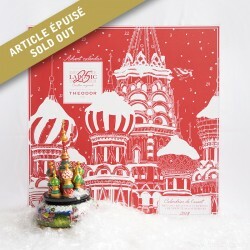 For this year 2019, THEODOR plunges you into a magical universe onthe "Russian" theme before Christmas with its brand-new Tea Advent Calendars for 24 days of tea happiness and pleasures, between sweet infusions and flavored tea creations, between exceptional plain teas and other pretty surprises... A gift to give someone or yourself for sure! New Year Tea Calendar There are 2 products. 2018 Advent calendar containing teas, herbal teas and very pretty surprises.